We watch a variety of shows here at various times, depending on when I'm working that day. We switch it up because I can only handle so much of any one kids' show. They're fairly irritating, I would say. Of course, so are most adult shows. I work in the living room, so I see all these shows, and I've ended up with a couple of favorite characters. 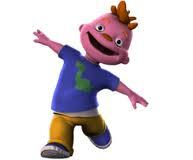 1) Gerald on Sid the Science Kid. I love him. He's vibrant and full of energy and shows how kids can be just this side of good even if they're acting hyper. He's got funny ideas, and he's confident in himself. I find him to be a good role model for my kids, even if he is a little scary looking. 2) Swiper. 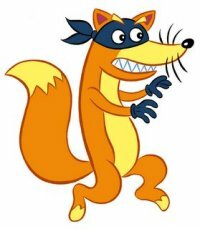 He's, quite simply, the least annoying character on Dora. His "oh, man!" is adorable, and it's proved in the Christmas special that he has a good heart. 3) Ernie. He's been my favorite Sesame St. character since I was a kid. For many of the same reasons I love Gerald, in fact. He's lively, optimistic, fun, and funny. He's inquisitive. Even if he's annoying Bert or bothering his neighbors, he's trying to make life better for them. Plus, he has a band of counting sheep. Does it get cooler? I still remember the mummy skit. It still scares the heck out of me. 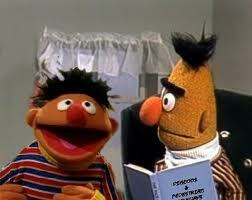 Ernie is where it's at. 4) Duck. All the same reasoning. Apparently, I love silly, fun-loving, slightly annoying characters with charisma and a good heart. What can I say. 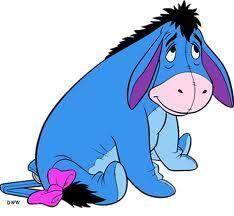 5) Eeyore. The one exception to my pattern. Something about his glum, pessimistic demeanor is so endearing to me. Yes, he sees the worst in everything, but he brightens up when his friends come through for him, which is almost every episode. Plus, he never takes his feelings out on other people, and he's always willing to see the other side. It just takes a little convincing. Honorable mentions go to Kermit the Frog, the Moonbear, the Spider Monkeys, and Curious George (tied with The Man in the Yellow Hat). We are fans of Wyatt and Red from "Super Why." Sid tops my list as well, but that is mostly because I am the Alpha Geek in our house. Did you know Ernie & Kermit were the first muppets made with smiles? We do love us some Sesame Street & Muppets in our house. I have to say, Olivia. One of the reasons (albeit shallow) is our daughters name is Olivia. And who doesn't like a cute pig? Growing up, I have to say I LOVED the roadrunner. Bugs Bunny was right up there too. Sesame Street (Go Cookie Monster!) and The Muppets!